Heading into tonight's first presidential debate, signs point to a presidential election that could go either way. Hillary Clinton has an average lead of about 3 points over Donald Trump in the national polls. However, the four most recent polls, out yesterday and today give her a lead of only about 1.5 points. At the state level, recent polling also points to a tight race. 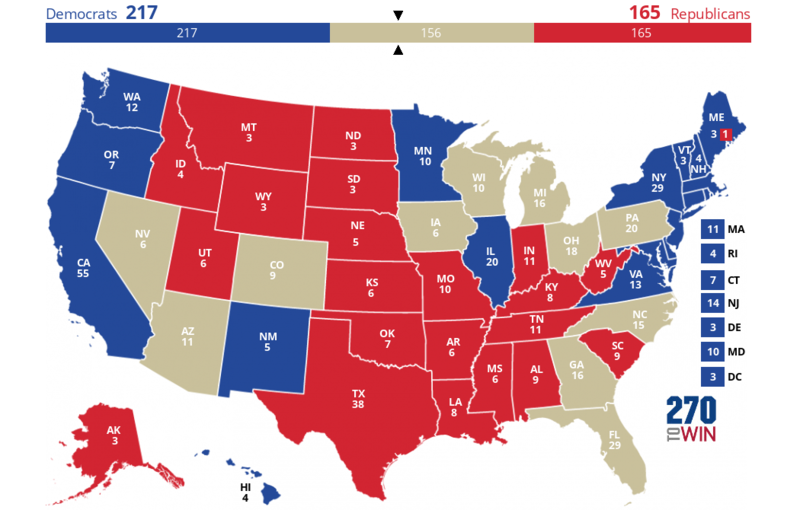 The map below highlights all states* with a current polling spread of five points or less. 11 states, representing 156 electoral votes. Keep in mind that only four states were decided by five points or less in 2012. The forecast models from FiveThirtyEight, from which we've derived electoral maps (updated hourly), have also tightened considerably in recent days. The presidential election is in 43 days. Some early voting is already underway. * For this map, we've excluded Texas and Mississippi due to limited polling, all of which was prior to the recent Trump surge. We do continue to show those as toss-up, along with additional categorizations (leaning, likely) in the electoral map based on polls.